Ice is a crystalline substance comprised of water molecules. Water can crystallize in several different structures depending on temperature and pressure at time of crystallization. Only one phase, ice Ih, forms under natural conditions found on Earth. Ice crystallizes with hexagonal symmetry. The identity of individual covalently-bonded water molecules becomes blurred in the crystal environment. Each negatively polarized oxygen atom is tetrahedrally coordinated, with strong electrostatic forces (hydrogen bonds) existing between oxygen and four adjacent (positively polarized) hydrogen atoms. The following illustration shows a view of the molecular arrangement in crystalline water. Three double-stacked hexagonal units are shown are shown in the illustration, along with several "loose ends" or molecules at the edges, hence not fully incorporated into the crystal structure. At the upper left, a single gas-phase water molecule is depicted. The hydrogen-hydrogen bond angle in gas-phase water is 104.5 degrees. This angle does not quite match the tetrahedral angle, 109.5 degrees, but it is close enough that hydrogen and oxygen atoms in ice strongly align with their tetrahedrally coordinated neighbors, the water molecules becoming slightly distorted (H-H bond angle in ice is ~106.5 deg.) in the process. 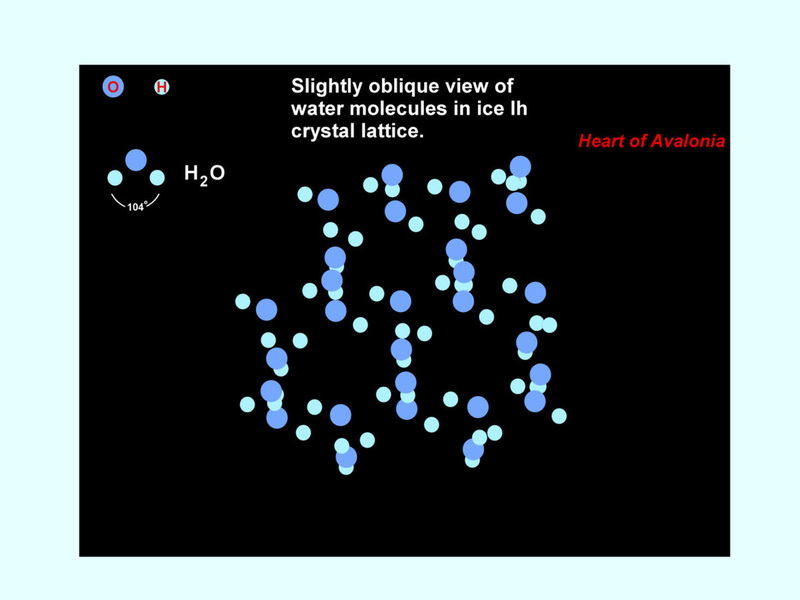 The highly favored molecular alignment in ice is not optimally closely packed. In liquid water, where molecular alignment is less ordered, the molecules fit closer together on average. Thus, ice is less dense than water. The melting point of ice is 0 deg. C at atmospheric pressure under ideal conditions of crystallization. These conditions are realized only within the internal volume of an unstressed single crystal containing no impurities. At the surface of an ice crystal, hydrogen bonding is interrupted ("loose ends", above diagram) and a less ordered noncrystalline state is favored. A liquid-like layer exists at the boundary between ice and air, ice and rock, and at grain boundaries between ice crystals. Application of stress is expected to favor the crystalline state in situations where the stress forces atoms to move within a reduced volume. However, in an open structure like ice Ih, increasing stress distorts bond angles and lengthens bonds, overcoming confinement effects and, in net result, favoring the noncrystalline state. Impurity atoms, molecules or ions existing within an ice crystal distort the local geometry of the crystal, weakening bonds in the disturbed area and favoring the noncrystalline state. Thus, in ice Ih, surfaces, stress and impurities all result in freezing point depression. When water freezes, the formation of new hydrogen bonds releases heat of crystallization which flows out to the environment. When freezing is inhibited by surface effects or by stress, the heat of crystallization is transferred over a temperature differential corresponding to the freezing point depression. This flow of heat across a temperature difference (thermal gradient) allows work to occur. This work is what enables the crystallization of ice to break and move rock. In the ice segregation process, water inhibited from freezing by close contact with a surface (pore water), can exert force over a distance as it migrates to, and enlarges, an existing crystalline mass (ice lens). In the ice expansion process, water crystallizing under hydrostatic stress can exert force over a distance as it converts from liquid water to the higher volume ice Ih phase. Properties of ice relevant to its behavior in glaciers or as a frost-wedging agent are summarized in the above table. Density is important in determining the pressure exerted by an ice column of a given height. Thermal conductivity and heat capacity are used to calculate thermal diffusivity which determines the response of the temperature regime in cold glaciers (glaciers below the melting temperature) to changes in weather and climate. In determining the depth of the active layer in permafrost, diffusivity and heat of fusion are important. The pressure melting point of ice determines the temperature versus depth profile in ice sheets that are temperate (at the melting point throughout) and helps in the understanding of glacial plucking. Plucking is the process whereby glacier-induced stress is, in effect, transferred through pores and joints in rock by upstream pressure melting and downstream refreezing. The chart below shows the pressure melting curve for ice Ih. It is useful to note that the freezing-point temperature reductions in ice under pressure are very small, reaching 1 deg. C under a layer of ice over 1 km thick. There are two main consequences of this. First, pressure melting effects are only significant in glaciers that contain liquid water in conjunction with ice and hence are stabilized very precisely at the pressure melting temperature (temperate glaciers). Second, cooling confined water even slightly below the zero-pressure freezing point (0 deg. C) rapidly results in very high stress relative to what is needed to break rocks in tension. When ice is exposed to stress, it will undergo an elastic deformation which is recoverable upon removal of the stress. No permanent changes to the relative positions of individual atoms in the crystal occur during elastic deformation. Creep, in contrast, is an irrecoverable (plastic) deformation of a crystalline material that results from prolonged stress exceeding the yield stress. Ice, because it is usually very close to its melting point, has a low yield stress in most situations. Plastic deformation of a perfect crystal would require the simultaneous breaking and remaking of all the bonds across an entire crystal plane. Real crystals contain defects that allow creep to occur without disrupting as many bonds. Defects present in ice crystals include vacancies (missing molecules), impurities (foreign atoms, ions or molecules), dislocations, crystal grain boundaries and macroscopic defects like cracks and air bubbles. Dislocations and grain boundaries are the most significant contributors to ice creep. Dislocations are linear defects in crystals that can be visualized in terms of the intersection of planes where a plane with an extra layer of molecules terminates against a plane where the molecular layers are normally spaced. The illustration below shows a 2-dimensional model of a crystal lattice containing a dislocation. The purpose of the diagram is to demonstrate how the lattice can deform under stress when the position of a dislocation shifts. When shear stress as indicated is applied to the unstressed crystal (top), a dislocation (blue) migrates one lattice position to the left (bottom). The motion of the dislocation accommodates a small displacement (thickness of green bar) in the lower portion of the lattice, relieving the stress. The energy necessary to move the dislocation (activation energy) is much lower than the energy needed to simultaneously disrupt bonds across the entire lattice. 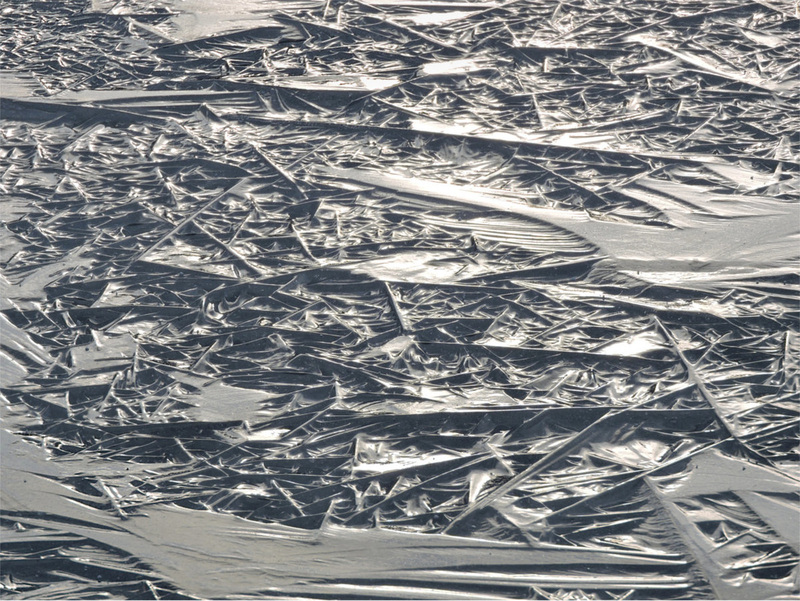 Ice near melting contains abundant dislocations, and, under stress, more dislocations will form at grain boundaries and then propagate through the crystal grains. The ease with which dislocations form and move in ice gives the crystalline solid flow characteristics that resemble those of a highly viscous fluid. Glacial ice is polycrystalline and sliding along grain boundaries also contributes to creep of glacial ice. Crystal grains in ice can become aligned during plastic flow, accelerating deformation. Movement of dislocations, however, is key in understanding the slow but resolute movement normally associated with glaciers. Creep is characterized by a strain rate (percentage change in length per unit time) that depends on stress magnitude, stress configuration (only deviatoric stress causes creep) and temperature. A sample strain rate is provided in the ice properties table above for a temperature of -10 deg. C and a uniaxial stress of .5 MPa. With the indicated strain rate of .0007/day, a 1 meter long cylinder of ice would shorten (via creep) by 0.7 mm after 1 day of stress exposure. Ice can creep at much higher rates under concentrated stress (rate rises approximately with the cube of applied stress) and at temperatures nearer freezing. When stressed in tension and forced to deform at rates exceeding normal creep rates, ice will fracture.